THE jewel in BMW's crown is still shining. Re-launched late last year with a host of updates and improvements, BMW has polished, buffed and further refined its X5 large high-riding wagon. Spend some time in the BMW X5 and it's quickly apparent why this was Australia's most popular luxury offering in its segment last year. Securing more than 18% of the market, BMW had no issues moving old stock ahead of this new model. And things are about to get even better for the X5. A purely rear-wheel drive variant is about to arrive starting at $82,900. But for those who can wait, we jumped into the diesel ($99,900) and V8 ($133,900) models which are likely to be the most popular with buyers. Families and those with active lifestyles have a close friend in the X5. Space is outstanding front and back, perfect for kids and adults. All the dials and operations are straight forward, the digital head-up display which projects your speed just below the driver's eye line onto the windscreen is a useful tool even though the analogue speedometer is crisp and clear. Central to everything is iDrive. First iterations of the iDrive system were somewhat challenging. BMW has since refined its operation and everything is relatively simple nowadays. One issue is the driver can't see the radio button on the far side of the control knob, although once you spend time in the car you become accustomed to its position. Leather-clad seats, dual zone air con with individual buttons for fan and temperature control along with shiny inlays across the dash and doors makes for a fittingly premium environment. 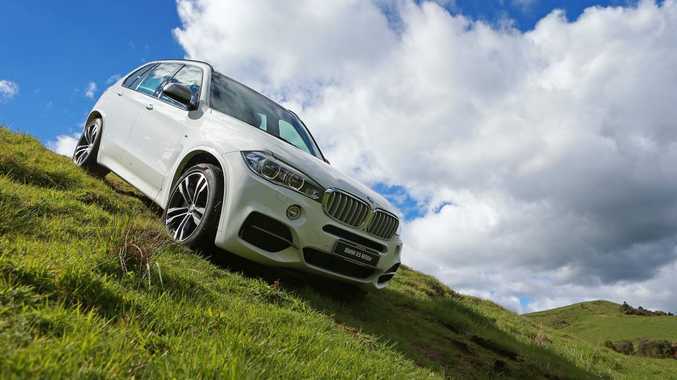 Hulking and broad, the BMW X5 has an ability to shrink around the driver. Nicely adept and controllable, you can confidently stride out on the highway or negotiate some twisty rural roads with poise. During the launch event in New Zealand last year, we felt BMW's move to electric power steering had made things too light and less dynamic. Happily none of that was detected in either model sampled Down Under. Whether idling around town or really pushing things in tight bends, the X5 answered varying driving questions astutely. The twin-turbo diesel is a strong unit and rarely does it sound like an oil-burner. Although if you are seeking a lovely exhaust soundtrack, it's hard to go past the hairy-chested bent eight. It possesses a lovely turn of speed and manages the 0-100kmh sprint in just over five seconds. One feature worth adding is part of the Driving Assistant package which includes warnings for lane departure, forward collision and pedestrians, along with a rear view camera and 360 degree surround view. That 360 degree view is handy when trying to slot yourself into tight car parks as it delivers the perfect perspective to ensure you are adequately within the lines. Anyone looking for something unique can head for the extended options list. It's not quite War and Peace, but it is long. Buyers do have two no-cost internal and external Design Pure packages called "Experience" and "Excellence" which has specific colour and inlay combinations. Although the basic X5s are far from stripped out shells in standard form, with standard features including alloy wheels, front and rear parking sensors, leather trim, automatic lights and wipers, Bi-Xenon headlights, LED front fog lights, high-beam assist, sat nav, two-zone air con, smartphone connectivity also for audio streaming and internet access and a 26cm colour screen. You could also consider the Audi Q7 (from $90,500), Mercedes-Benz ML-Class (from $99,045), Infiniti FX (from $76,400), Porsche Cayenne (from $100,200) and Range Rover Sport (from $123,100). This pairing is chalk-and-cheese when it comes to the bowser. The 30d produced an ultra thrifty 7.7 litres for every 100km. The 50i achieved more than 12. Those figures are higher than the official average, but the diesel was pretty impressive given the X5's size and weight. Anyone who hasn't driven a premium brand previously should first investigate the servicing and insurance costs. With space for five adults, the X5 is brimming with common sense. The 40-20-40 rear seat split is brilliant for carrying sporting equipment and other awkward-sized gear while leaving some pews upright. We found it perfect for bikes and surfboards while still leaving the cherubs in place. A third row of seats can also be optioned ($4600 on the 30d and $3200 on the 50i). There are dual cup holders up front (as well as in the centre rear fold-down arm rest) and excellent space in the doors for large bottles…like wine. The propeller badge on top of the trademark kidney grille speaks volumes. X5s have been extremely popular with yummy mummies, and they have a tremendous sense of status. These new models don't look dramatically different, although it has a new headlight design and there are also some other tweaks which further polish the executive styling. Under pressure from a rampaging Mercedes-Benz and Audi, improvements to the X5 are timely for BMW. The X5 remains the leader in this premium genre, and it has got even better with more efficient yet faster powerplants. While we liked the immediacy and rumble of the V8 it's difficult to go past the oil-burner for efficiency and performance. The BMW X5 is a tremendously appealing high-riding wagon with excellent internal space, luxury finishes and premium persona. What we liked: Real-world fuel economy from the diesel, easy to drive despite size, internal space and boot area with 40-20-40 folding rear seats. What we'd like to see: Capped price servicing plan, less options. Warranty and servicing: Three-year unlimited kilometre warranty. BMW has condition-based servicing, but intervals are usually annually or 15,000km. Engines: 3.0-litre six-cylinder twin-turbo diesel generating maximum power of 190kW @ 4000rpm and peak torque of 560Nm @ 1500-3000rpm; 4.4-litre twin turbocharged V8 petrol 330kW @6000rpm and 650Nm @ 2000-4500rpm. Consumption: 6.2 litres/100km (combined average); 10.5L/100km. Performance (0-100kmh): 6.9 seconds; 5.0sec. Bottom line plus on-roads: 30d $99,900; 50i $133,900.